HomeNewsNow available: ASAP Utilities 5.6! Now available: ASAP Utilities 5.6! We're proud to officially announce the new version of ASAP Utilities! The past year we have worked, in cooperation with many of our clients, on the new version of ASAP Utilities. Several improvements have been made to help you save time in Excel. To upgrade, just install the new version 'on top' of the current version on your computer. All our clients get version 5.6 free of charge! How it makes YOU rock in Excel? These short tutorials are guaranteed to save you time and speed up your work in Excel. Enjoy! ASAP Utilities helped its users to save 10 Million hours together this year! On average ASAP Utilities saves people 29.5 hours each year (measured among 73,932 users in October 2015). With an estimate of 350,000 users in total, this makes a total savings of over 10 Million hours all together saved while working in Excel. Each and every year. Our list of clients grew to over 13,500 organizations in over 140 countries. Our Facebook page is now liked by more than 300,000 people from around the world! Yes, that is Three Hundred Thousand fans! We're very proud! ASAP Utilities continues to grow and improve thanks to your support, your suggestions and your encouragement and shared enthusiasm. 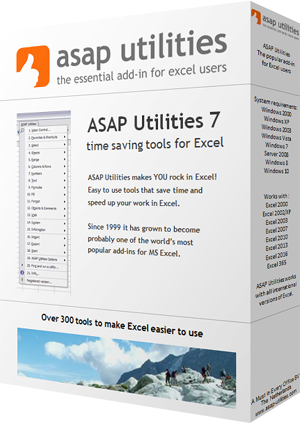 Continued joy and time savings when you work in Excel with ASAP Utilities. Continued development; improvements based on our research and your suggestions and feedback when we work on the next version. ASAP Utilities continues to grow and improve thanks to your support, your suggestions and your encouragement. ASAP Utilities in more languages to help more people worldwide, in addition to the currently already available English, Spanish, French, German and Dutch language (deadline: February 2016). A version for the special 64-bit edition of Excel (deadline: before the end of Q1). Perhaps a version for the Apple Mac edition Excel? Our thanks go out to each and every one of you for your feedback. ASAP Utilities continues to grow and improve thanks to your support, suggestions and encouragement.